Product description : Like many other strontium salts, strontium nitrate is used to produce a rich red flame in fireworks and road flares. 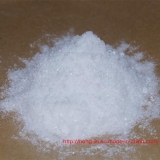 The oxidizing properties of this salt are advantageous in such applications. Strontium nitrate can aid in eliminating and lessening skin irritations. When mixed with glycolic acid, strontium nitrate reduces the sensation of skin irritation significantly better than using glycolic acid alone.